My mother rarely baked bread. Although she was a creative, gourmet cook, baking was not her forte. Fortunately, we had access to a wonderful bakery in the middle of town. Often, Mother would wait in the car while my brother and I were sent inside. One of us would say, "Four loaves of white, sliced...please." The clerk would select the tender loaves and drop them one at a time between the jaws of the slicer. I loved watching the machine cut through the bread...it was like magic. Next, the loaves were sleeved into waxy, white paper bags and handed over. We each took two bags and one of us would give the clerk a dollar bill, which was the price of four loaves in those days. I loved it when the bread was still warm for then, the ride home was pure heaven with that freshly-baked aroma right under our noses. Sometimes my mother would come into the bakery with us so she could pick out a coffee cake or hard rolls. My favorite memory, however, was when she bought cinnamon bread from the White Cross Bakery...it was so special; I have never seen bread like it anywhere else. The swirls of cinnamon in each slice were cxceptionally thick and dripping with gooey sweetness; but, the top of the bread was the most amazing for it was coated with a hard, candy-like cinnamon-flavored glaze...my mouth still waters at the thought of it. The White Cross Bakery is long gone... and even though I have been unable to duplicate that special cinnamon bread, I will keep trying. Today's recipe, while not a cinnamon loaf, is a family favorite called Danish Potato Bread. It is delicious and moist with a velvety texture.This loaf goes well with a hearty soup, like yesterday's Soup Au Pistou. It is also wonderful topped with a slice of meat or chicken salad and eaten open-faced. Spray inside of bread pan lightly with vegetable oil. Add all ingredients in the order suggested by your bread machine manual and process on the DOUGH cycle. Check machine and add more flour as needed to keep dough from being too sticky. Remove dough after kneading/rising process to a floured board. Roll out into a rectangle slightly larger than the width of a bread pan and twice as long. Beginning at a short end, roll bread tightly into a loaf. Pinch the seam together and tuck the ends under so the dough will fit into the prepared bread pan. Spray loaf lightly with veg. spray and also one side of a sheet of waxed paper. Lay the paper over the pan, sprayed side down. Put loaf in a warm, draft-free place until dough doubles in size. Preheat oven to 375 degrees. Remove waxed paper. Bake loaf for 20 minutes; *check for doneness. Continue baking if necessary. You may need to cover top of bread lightly with a sheet of aluminum foil to prevent overbrowning. Remove pan from oven and gently tip pan so loaf releases to a wire rack. Turn loaf upright to cool. Dust top of loaf lightly with flour, if desired. 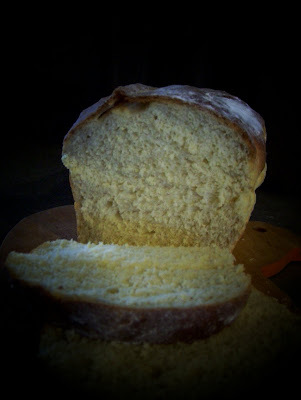 *You can tell a loaf is finished baking if you flick the top with your finger and it produces a hollow sound. Note: You may make this loaf without a bread machine. Mix ingredients - liquids together first. (water should be warm). Add yeast to water and let proof (form bubbles). In a second bowl, mix dry ingredients together well and add one third at a time to liquid mixture. Mix well and transfer to a well-floured board. Knead, adding flour as needed, for 10 minutes until dough is smooth and tender; form into a ball. Grease a large bowl. Put dough in bowl and then turn dough over...the top of the dough will now be greased from the residue inside the bowl. Cover bowl with a dish towel and place in a warm, non-drafty place. Let dough rise until doubled. Remove cloth and punch down dough and proceed from the point in the directions above where dough was removed from the bread machine. Note: I have sometimes added seeds to this dough after removing it from the machine (sunflower, sesame), with tasty results. Sprinkle the rolled-out rectangle with seeds...roll up dough and re-roll. You can continue this process until you are satisfied with the quantity of seeds incorporated into the dough.